The second interview we want to share with you from the research behind the Jiu Jitsu Style Magazine ‘BJJ in Schools’ article is from Beth Thrasher, who heads up the Vector Jiu Jitsu project over in the USA (visit their Facebook page here). To read the article for which this interview was a source, pick up JJS #19. How would you summarise your project in a sentence? A comprehensive youth development program serving “at-risk” youth using the vehicle of Brazilian Jiu-Jitsu to instill 3 core values: Know Yourself, Better Yourself and Help Others. How did you (or the founder, if it wasn’t you) go about setting up that project? I am a public school teacher in Mississippi at one of the lowest performing schools in America. Our student population is plagued by generational poverty, violence, crime, gang activity and academic malaise. I had worked for several after school tutoring programs funded by the government that were completely ineffective. Brazilian Jiu-Jitsu had been the vehicle that brought both my husband, and I out of deeply depressive periods in our lives (before we’d even met, and 1,000 miles apart), it was what had also brought us together. We concluded that, if Brazilian Jiu-Jitsu could be that powerful of a force for positive change in our lives, it could be the same for my students. 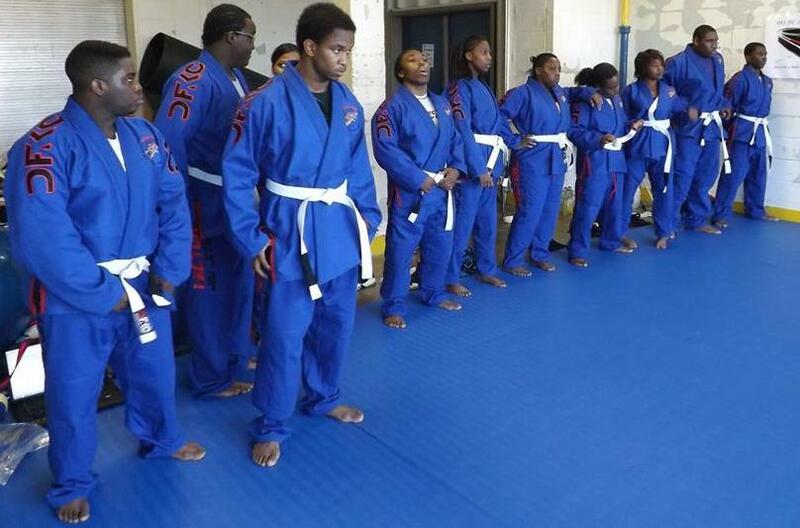 After doing a research literature review to support our claim that a martial arts program for urban youth would have positive outcomes, I approached the principal at my school and asked if we could start Vector Jiu-Jitsu as an after-school club at Wingfield. Without batting an eye she said “Sure, go ahead. Just find your own money to fund it.” I made sure to follow up with the school district’s legal counsel and executive director who both gave their stamps of approval as well. So, in the summer of 2012 my husband and I began to solicit local politicians, church leaders and businesses for a $3,000 sponsorship to purchase mats and begin our program. The response was non-existent… save for the earnest support of city councilman Tony Yarber. Councilman Yarber, a martial artist himself, fully understood the power physical arts can wield in a young person’s life. He worked to gain us audience with local business firms, and they were enthralled about our program but pledged no funds. In the end, we were “loaned” $1,500 from the JROTC Booster Club at our school, courtesy of LTC Kenzie Wallace’s endorsement and we, the Thrashers, provided the other $1,500 (no small feat for our single income household with 2 toddlers). Mats were delivered on December 18th, 2012 and the first official classes for Vector Jiu-Jitsu began on January 7th, 2013. What was the biggest obstacle to getting the project underway? What would you say has been the project’s biggest achievement to date? There are two 19-year-old boys in our program who have looked us in the eye and said that they were going to drop out of high school before Vector came along. What has been the biggest ongoing challenge? The biggest challenge has been being limited in our access to the facilities and students at Wingfield High School exclusively. We need to expand to serve more kids in the community and thus achieve a true paradigm shift out of the cycle of perpetual poverty and academic failure. What are the main benefits you feel the children get out of your project? The main benefit our children receive is personal accountability. Most of our students have lived their entire lives with no one expecting much from them. We expect, and in fact demand, that they do their best, with excellence in every endeavor. Whether it’s not letting pants sag, refraining from cursing, lifting their voice to stop a bully or correcting a classroom assignment to move a “B” to an “A”, Vector Jiu-Jitsu mentors expect that students become a better version of themselves every day. Finally, is there anything else you’d like to add regarding your project? You can throw money at the declining academic performance in American children all you want, but if you don’t stoke the intrinsic fire within for those children to take advantage of resources already at their disposal than your money is wasted. We truly feel that jiu-jitsu WILL stoke that fire in hundreds of thousands of American school-age children and thus, Brazilian Jiu-Jitsu might just be what saves public education in America!